The take-away for businesses is that they should not rely on one person to handle all of the duties on Twitter, Facebook, Linkedin, YouTube and where ever else the company needs to reach customers and partners. Can’t be done, not if you want to improve, grow and attract more friends, fans and followers. Everyone in the organization is needed to contribute. That’s how a business scales up social media. At the financial education conference, called the R.I.S.E. Global Forum, students and staff at the host University of Dayton shared the social media updates. Mike Kurtz, head of the university’s video production service, directed television coverage and also made time to shoot and post photos. 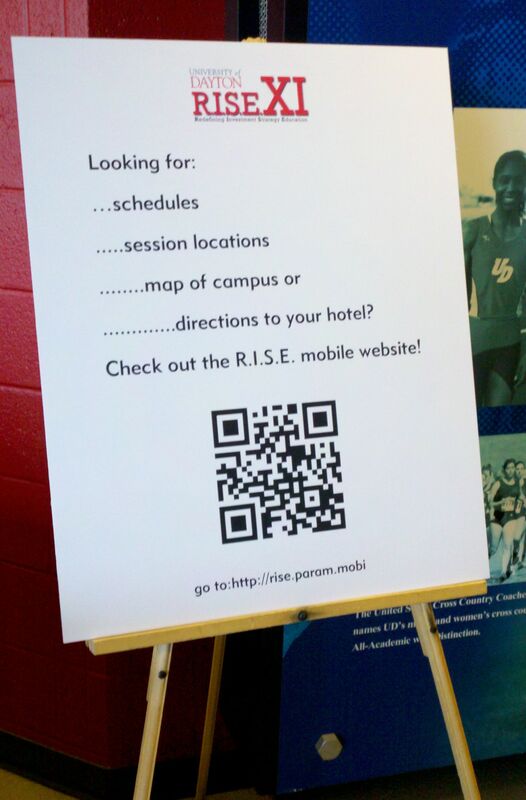 Kevin Schultz, the social media manager on the university admissions staff, pushed ideas for making conference info available by phone beyond everyone’s expectations onto a new mobile website (see on your phone at http://rise.param.mobi). Matt Dewald, assistant director of communications, shared messages from the conference on other social streams for the university’s alumni and supporters around the country. One of the big bosses even uploaded the first photo from the conference. Teri Rizvi, assistant vice president/communications, spotted Walton watching behind the audience and posted a cell phone picture of him early Thursday morning. I can’t think of another way for a boss to send the message throughout the organization about how everyone has a part to play with social media. A team of UD students, organized by another student, Kelsey Stroble, added updates on Twitter and plans to continue tweeting throughout the three-day conference. And Peggy Nicodemus, the conference coordinator from the School of Business, made sure that the printed program, signs throughout the conference venue, and announcements on stage all pointed attendees to the conference info and updates online. Now, for the truth in advertising part. 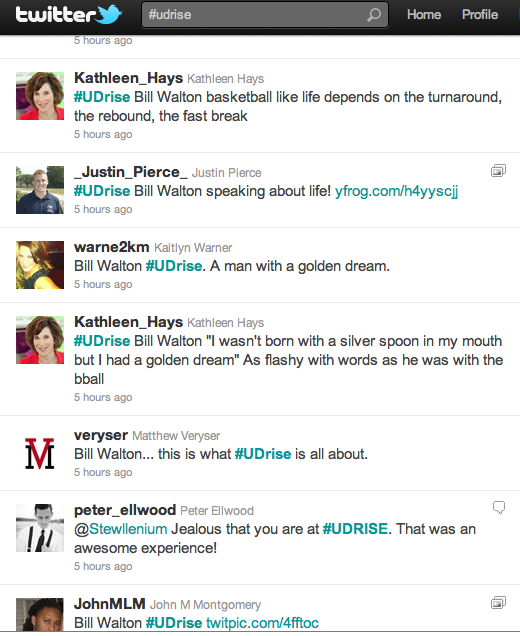 I work for UD as a consultant, and helped plan the social media piece for the conference. I’m telling you that to be able to tell you this. No way do I get all of this social media work done by myself. Not in an arena filled by more than 800 conference participants, with dozens of speakers and panelists on stage over 10 hours. Students, staff and R.I.S.E. participants contributed 176 updates, comments and replies between 8:30 a.m. and 6:30 p.m. Thursday. That’s just on Twitter. Dozens more updates were contributed from the conference on Facebook, YouTube, Linkedin and photo sharing sites. My point: social media doesn’t scale up. Not with one person doing it. That’s the lesson from a college campus. Walton, the basketball hall of famer, reminded his audience that success comes from teamwork. That’s the lesson Walton said he learned from his college coach. And that’s how the sports lesson also applies to business. This entry was posted on Thursday, March 31st, 2011 at 11:12 pm and is filed under Business, Facebook, Linkedin, Photos, Social Media, Twitter, Video, You Tube. You can follow any responses to this entry through the RSS 2.0 feed. Both comments and pings are currently closed.